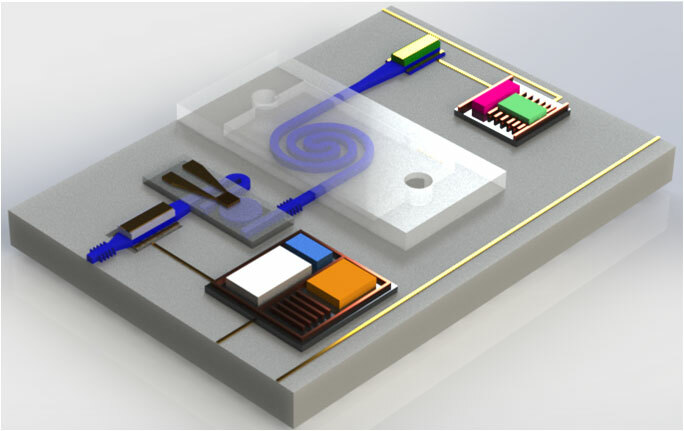 Compact carbon dioxide (CO2) gas sensor based on integrated mid-infrared (MIR) photonic circuit. The waveguide between the MIR source and detector is the component responsible for analyte interaction. The spiral configuration of the waveguide increases the interactive length and thus enhances the sensitivity. Mid-infrared (MIR) wavelength, ranging from 2 to 20 μm, covers a lot of molecules' characteristic absorption spectra. This feature gives the opportunity to build up MIR photonic sensors used in environmental and industrial process monitoring, as well as bio-sensing. The atmospheric window in MIR range can also be utilized for free-space communication and light detection and ranging (LIDAR). Silicon photonic technology is an attractive solution for such applications, due to its advantages and successes exhibited at the near-infrared range. A host of complementary metal-oxide-semiconductor (CMOS)-compatible platforms, including silicon-on-insulator (SOI), silicon-on-silicon nitride, germanium-on-silicon, germanium-on-SOI, germanium-on-silicon nitride, sapphire-on-silicon, silicon germanium alloy-on-silicon, and aluminum nitride-on-insulator are explored in order to realize low loss waveguides for different MIR wavelengths. Several passive and active MIR photonic devices based on these platforms have been demonstrated by different research groups over the world. The state-of-art achievements are comprehensively reviewed in Photonics Research, Volume 5, No. 5, 2017 (T. Hu, et al., Silicon photonic platforms for mid-infrared applications). The authors' research and development effort on SOI and silicon nitride-on-insulator platforms for short MIR range are also introduced. Low loss MIR waveguides and basic passive components working at 2 and 3.8 μm have been demonstrated. To illustrate the application, the implementation of a CO2 gas senor is proposed. The theoretical analysis predicts that the spiral MIR waveguide based sensor can obtain a detection limit as low as 20 ppm when the propagation loss is 1.5 dB/cm. The detection sensitivity can be further improved if the propagation loss is reduced. Dr Patrick Guo-Qiang Lo, the Program Director of Nano-Photonics in Institute of Microelectronics (IME), Agency for Science, Technology and Research (A*STAR) Singapore, points out that the related work is of great importance in extending the applications of integrated photonics. Further work should focus on the realization of high performance MIR passive devices and the integration of them with MIR sources and detectors, to demonstrate gas sensors with high sensitivity.